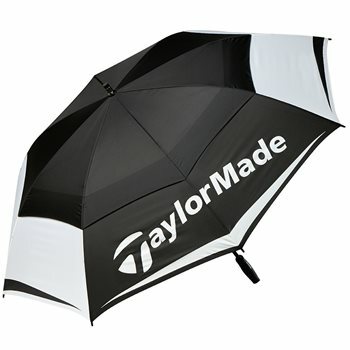 All / Accessories / Umbrella / TaylorMade / Tour Double Canopy 64"
You can earn 65 yards with this purchase! New Men's TaylorMade Tour Double Canopy 64"
The TaylorMade Tour Double Canopy 64” auto-open umbrella is preferred by TaylorMade Tour players and features WindPro® technology that is designed to withstand heavy winds. The umbrella features an ergonomic sport-grip rubber-coated handle, a lightweight fiberglass shaft, and clean and bold TaylorMade branding.